Ricky and Leon depart and new guests arrive. a few hours getting some stale water out of the anchor locker. day was spent on the water. We had a perfect vacation together. On Sunday, we picked up anchor and sailed over to Union Island. the hard-core drinkers (like Mom). 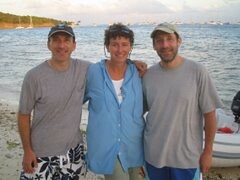 returned to the Tobago Cays with our new guests late this afternoon. Ricky and Leon visit Sabbatical III. had supper at Gingerbread House. out of the water with its wings spread wide. McCarthy was brought us home baked banana bread in the morning. customers, which is rather unpleasant for the customer. and how the sea cures pus filled sores and makes one a strong man. arisen on his head from at least a dozen hard knocks. re-fueling ( only occasionally)… It is really a big process. a while to fill up a tank that holds 600 liters of diesel. the winds calmed and the whole anchorage seemed flatter. works at all. We will have to try again another time. 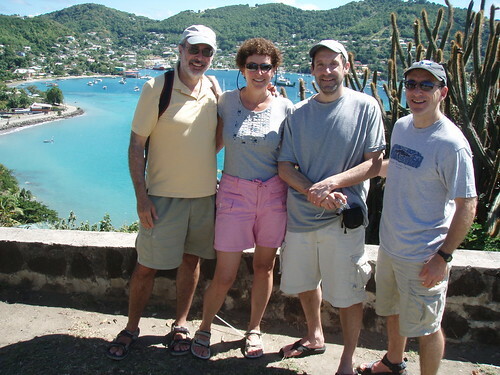 headed south for the island of Bequia which is part of St.
Only one more day til Ricky and Leon arrive. Hooray ! Have a look at the new photos in our slide show. Hold the cursor on a photo to see any caption. On Wednesday, January 17th we set sail from St. Anne for St. Lucia – a distance of only about 24 nautical miles. We had 15-18 knots of breeze from the east north-east so we had a smooth and exhilarating sail all the way here. We put on some great classical music and just enjoyed the air, the view and the beautiful music for three and a half hours. 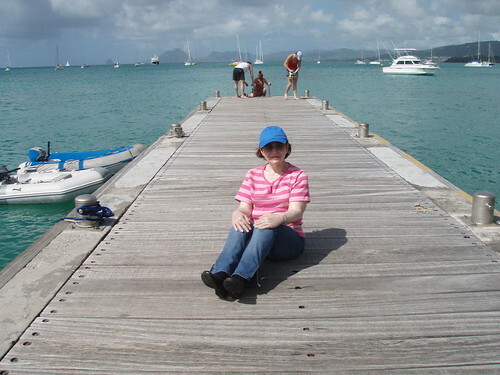 It is a bit hard to dock in St. Lucia as you have to back in to the slip, and tie onto a pole. Luckily they have a lot of dock-hands at Rodney Bay Marina – and two guys were on the dock to help us pull in. Mark is getting really good at backing the boat in – although he gets pretty nervous beforehand (for good reason). Anyways, we were kind of beat from the sun and just spent the rest of the day cleaning the boat and ourselves. Naomi took us out for a wonderful dinner at Castaways Restaurant. On Thursday morning Bernita’s daughter Dahlia and her youngest son Malcolm came to the boat at 10:00 a.m. Bernita is a wonderful woman from St. Lucia who has been taking care of Kitty (Mark’s mom) for the past 4 years in New York. The rest of her family is in St. Lucia. Unfortunately when Dalia came to the dock to find us, we were onboard but below with the air conditioning on, and she saw the boat closed up and thought we had left to do errands. It wasn’t until 11:00 when Mark, who was sitting nearby in an outdoor internet cafe, ran into Dahlia, and steered her back to the boat for an emotional meeting with Naomi. A little later Bernita’s niece Eleanor and her son Gerie (spelling?) joined us as well. It was a great group to have on board. We had sandwiches and drinks and then decided to go for a short sail. Malcolm and Dahlia had sailed with us 3 years before and were anxious to go again. Once we got out of the protected bay the wind and waves picked up quite a bit – and some of the guests were decidedly green. Only Gerie looked unmistakenly thrilled to be on board. Luckily it didn’t take us too long to get back to protected waters and everyone perked up a lot. Naomi left with Dahlia and Malcolm in the late afternoon. They were heading back to Dahlia’s house which is near the town of Vieux Fort at the other end of the island. 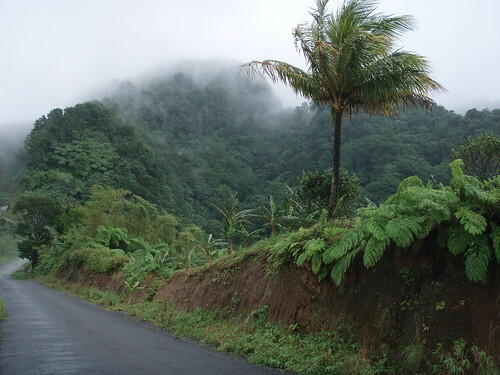 Although it is only about 20 miles away, you have to go through the big mountains of St. Lucia via windy roads to get there and it takes at least an hour and a half. So we tearfully said goodbye to them. Eleanor was kind enough to take us to a big supermarket nearby and then pick us up an hour later to help us with our groceries. She brought both her son Gerie and her daughter Chelsea (another absolutely sweet and adorable child). Gerie pushed my cart around the store, helped me pick out fruit, and insisted on unloading the cart at the check-out. He is a terrific kid and promises to be my e-mail pal. We are sad that we will not see them again on this trip – but hopefully at the end of our circumnavigation we will end up right back here in St. Lucia. 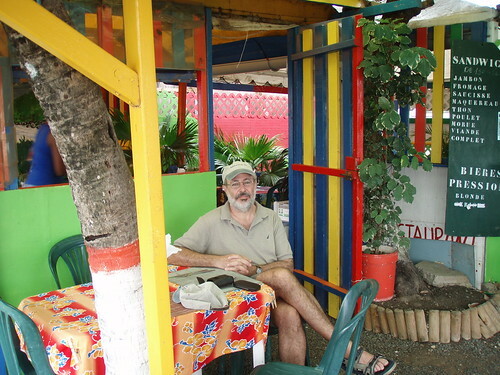 Yesterday was Monday, January 15th, and it was time for us to check out of Martinique. When we checked in, we had dinghied in to Le Marin from St. Anne where we are anchored to get to the customs office. It was an uncomfortable dinghy ride when we checked in on Friday – much too far to go in high winds and rough seas – and yesterday the conditions were pretty rough ( by Caribbean standards that is), so we decided we would make our way to Le Marin by land. We had seen taxis in town and we knew there was supposed to be a “communal taxi” that ran between towns for a very cheap price – so we decided we would see what we could find. On land we ran into another couple – from our neighboring boat “Zest” – who were also on their way to Le Marin to do their check-in and check-out. We decided to taxi in to town together. After waiting at the taxi stand and talking for about 30 minutes we realized something was wrong as no taxis showed up. We saw a taxi 50 feet away so I walked over to tell him we would all like a ride to Le Marin. The taxi driver had parked in front of the local lottery shop and when I asked him if he would drive us to Le Marin, he very rudely exclaimed that that would be impossible, and waved his lotto tickets at me. Hmmmmm. Ok, so then we saw another taxi parked nearby and I approached him. This guy said, no, he would not take us to Le Marin, he only goes to Fort de France. I told him we would pay him more than the regular taxi fare, but he was not interested. Our friend from Zest had a cell phone and she called the phone number posted on the taxi stand. It was hysterical, as the phone hidden behind the taxi stand – started to ring – but there was no-one there to pick it up except us. NOw it had been about an hour and we had not yet seen the “communal taxi” to Le Marin, nor did it seem possible to get a regular taxi. We waited and waited (while the second taxi driver continued to stand by his taxi, not securing any other passengers) . Suddenly we were confronted by an attractive, well dressed lady, who was intent on converting us to being Jehovah’s Witnesses. Even after our friend from Zest, said no, she was Jewish ( was she? ), the lady persisted in her quest to gain at least one convert. She even offered to take up to three of us to Le Marin in her small car, but we were all too chicken to get in the car with her. Meanwhile, our friend from Zest wandered off for a morning beer. It was now 11:45 and we knew that the customs office closes promptly at 12:30, so We were just about to give up, when suddenly the communal taxi showed up. He had a few other passengers who were going to some destinations several miles off the main road. He accomodated them and dropped them wherever they asked. Then he drove us to Le Marin (which is a harbor), and parked the car way up high on a hill. He told us that this was the stop. We looked down the very steep hill and could see the masts from the marina off in the indeterminant distance. Seemed a bit odd, and when we asked him how far it was to town, he responded, with a shrug, and said it was “just there”, not far at all. It turned out to be true to a certain extent. It wasnt far – but was down an incredibly steep hill and long set of stairs. We are still trying to figure out why he didnt just drive us down the hill. We made sure to get a return time from him for the trip back. return bus, but a normal taxi showed up, and much to our relief he was willing to drive us back to St. Anne. It was hot, and we were cranky, but Naomi thought it was all good fun, and kept us in good humour. Today, Tuesday, January 16th we were sure we were going to be leaving for St. Lucia, but continued high winds kept us from leaving the anchorage. In fact, we didn’t even leave the boat. Had a nice relaxing day – and a great “boat dinner” – meaning a big melange of stuff – canned and fresh. Just in case anyone is keeping tabs, Naomi had wine both last night and tonight. We are keeping her away from the edge of the boat. We left Grande Anse d’Arlet early on Friday morning headed for St. Anne on the SE edge of Martinique. It is only a 16 nm sail, but for most of the trip you have to head directly into the wind. The winds were strong, but luckily, the seas were not terribly rough, and we had a eautiful “motor” into St. Anne’s anchorage. This is apparently a very popular spot in Martinique, and we can see why. The anchorage is huge, and reasonably protected from any swell. It has mountains around it, but they are not terribly high, so they allow for a nice breeze to blow through the anchorage. The town is an adorable little tourist town with a good patisserie, several restaurants, well stocked grocery stores, a couple of fruit stores, plus a daily market where they vend all sorts of fruits and vegetables, plus a huge variety of spices and flavored rums. Very friendly and clean and French ( garbage cans everywhere and public toilets – both important things in the scheme of things). We had to check in to Martinique as we had already been in the country for a couple of days without checking in at either St. Pierre or Grand Anse, so as soon as we anchored we jumped in the dinghy and headed across the bay to the town of Le Marin where the customs office is. It was a 3 mile dinghy ride, and much to our chagrin, the wind was so strong and the seas so choppy that it was a pretty uncomfortable ride. Marin is a huge yachting center as well as the major yacht chartering marina around here and there were literally hundreds of boats in the harbor and at the docks. We managed to find the customs office at 12:20, just 10 minutes before they closed for the day. They checked us in incredibly quickly and efficiently – and we were done before 12:30. Starving, hot and thirsty, we stopped at the big local seaside restaurant there – and had a bad, slow, but otherwise enjoyable lunch. Sometimes the French style of serving can be frustrating – talk about taking it easy – they are so leisurely – I don’t think you can have a lunch in less than 2 hours anywhere. Interesting. We spent 90 minutes in an internet cafe trying to catch up on communications, and then headed back to the boat in calmer winds and seas than when we arrived. Mark’s sister Naomi arrived at the square in front of the church in St. Anne at the appointed time yesterday, along with some incredibly heavy bags filled mostly with gifts for Bernita’s family in St. Lucia. Bernita has provided loving care to Mark’s mother in New York City for the past four years. We had to use a halyard and winch to bring the bags onto the boat. That evening we returned to St. Anne to walk around, tried to make some phone calls, and had a lengthy dinner. This morning we checked out the open air market in St. Anne before hiking along a trail that paralleled the coast with the goal of visiting the beach at Anse Salines. It was a bit more of a walk then we bargained for so we headed back after crossing Pointe Dunkerque with a view to St. Lucia. It started to rain hard just as we approached the Restaurant Ouai Ouai adjacent to the Hotel Caritan. Rain squalls this time of year usually last all of ten minutes (except in the mountains), but this one lasted all afternoon. We had a 2 1/2 lunch overlooking the beach as the rain beat down on the roof. When we left it was still raining although not as hard. We picked up two of these great rotisserie chickens and a couple cases of Didier, our favorite sparkling water, and returned to the dinghy which had a 6 inches of water in the bottom. We left the dinghy pump on “Sabbatical III” and could not bail it out. It did not matter since we were wet from the rain and it was raining still. Upon arrival at the boat, Laura and Naomi skinny-dipped while Mark kept his nose strategically in a book. Tomorrow morning we have to go to Marin to perform the required check-out before sailing off to Rodney Bay, St. Lucia, weather permitting. fruits and vegetables, plus a huge variety of spices and flavored rums. calmer winds and seas than when we arrived. Mark’s sister Naomi arrived at the square in front of the church in St.
bags filled mostly with gifts for Bernita’s family in St. Lucia. so we headed back after crossing Pointe Dunkerque with a view to St.
to perform the required check-out before sailing off to Rodney Bay, St. Yesterday (January 10) at 7 am, we left Prince Rupert Bay, Dominica headed for Martinique. The wind was occasionally blocked by the high peaks of Dominica as we headed south but once we entered into the channel between Dominica and Martinique there was more than enough wind. We sailed across at 8+ knots with reefs in all of the sails. We arrived at St.Pierre about 2:30 and anchored to the north of the town dock, and promptly went below to rest. We we came back on deck, we noticed that another boat had anchored uncomfortably close to us and had left in their dinghy. European sailors, particularly French ones and charterers, have a much more casual attitude about anchoring than Americans. They enter anchorages at higher speeds, often drop their anchors while still moving forward, and do not always back down on their anchor to set it — plus they are more comfortable with getting quite close to other anchored boats. It is something that still leaves us uncomfortable. In order to retreive our anchor this morning, I had to have the boat do this slow-motion dance in order to avoid hitting our close-in neighbor who was parked right over it. Carribean is just a few miles away at Le Marin, so I expect charterers who just picked up their boats head up here as their first destination. We did not expect to visit Grande Anse d’Arlet. As we sailed south we saw this attractive little bay set among steep hills and pulled in on the spur of the moment. We thought we might like it enough to have my sister Naomi meet us here on Saturday instead of St. Anne/Le Marin. The water is beautiful and a large sea turtle kept swimming around the boat. Once ashore, we were not terribly impressed. It did not have much to offer except elderly French pensioners in bathing suits that were altogether too small. We bought a phone card to call the kids, but neither public phone worked. In addition, the dock is an awkward platform to get Naomi’s bag of goodies for St. Lucia onto the dinghy. baguette and the problem of dinner seemed to be solved. In the end, nothing beats eating on the boat. Tomorrow morning we will head for St. Anne or nearby Le Marin where we can catch up on email at an internet cafe, I can get some overdue research work done, and we can finally officially check-in. Our last day here in Dominica was great – spent tons of time in the water. The wind was from the west, almost an unknown situation here. It resulted in crystal clear water in the bay and we took advantage of it by spending a lot of the day swimming and snorkeling. Our pal Martin took us to the other side of the bay in his speedy wooden skiff (maybe 4 miles away), and we had a great snorkel amongst beautiful fan and brain corals, and an occasional moray eel. Tomorrow we leave early for Martinique. Sunday we did not leave the boat, except to swim. We mostly read books and did some light boat maintenance. A charter catamaran that came in after us decided to anchor right on top of our anchor (we snorkeled out to check) even though this is a big bay with lots of room and not that many boats. We asked them if they would move but they said that their windlass was broken. If I had a broken windlass, I would not have anchored where they did. They are still there today on top of our anchor. Martin told us we would sleep well on Sunday night since there were never parties on Sunday night as this was a religious island. However, there was a large Pentecostal Christian revival meeting with amplified sermons and song that went on until past 10 pm. The music was great but we lay in our bed not knowing how long this event would go on. Today we did a big tour arranged though Martin. We joined Jim and Ruth Smith of Harpswell, Maine on a full day trip across northern Dominica guided by one of Martin’s associates. It was a rainy morning and, as we headed up into the rainforest, it just rained even harder. This is the dry season so the intensity and length of the rain showers were unusual. We made the short hike to the “Cold Souffriere,” a bubbling volcanic spring that was cold to the touch — in pouring rain. The volcanic mountains were filled with vegetation and fruit trees. There were trees of coffee, lime, orange, papaya, banana, plantain, cinnamon, bay, nutmeg, cocoa, mango, soursop, custard apple, guava, and more. Our tour guide was constantly stopping the van to run out and get us samples of every variety of fruit, spice, and medical plants, plus some huge bromelia flowers. We also bought 4 grapefruit for 30 cents. We then went to the Red Rocks on the northeast coast of the island which was spectacular, followed by lunch of fish and assorted starches, and to a beach where the river meets the ocean. We had planned on swimming in the river but the rain had swollen it so much that we decided to not get in above our ankles. The sun finally came out in the afternoon but the rain did not detract much from an altogether delightful trip. We will stay here tomorrow (Tuesday) and try some snorkeling before leaving early Wednesday for Martinique. We hope to get to St. Pierre by Wednesday night and then to St. Anne by the end of the day Thursday. Thursday morning we took a taxi to the commercial port area to visit Electro-Nautic, the biggest chandlery around. I had a long list of items to purchase, some of which are not standard items in smaller chandleries, including the friendly and convenient Karukera Marine in the marina complex. This was clearly more a chandlery for commercial fishmen and larger commercial vessels rather than recreational sailors. The fellow who stepped up to help us spoke no English, but Laura was up to the task. If she did not know the word for a part, she described its use until our saleperson led us briskly across the large store to where the requested item lay. Jumbo Car in the marina complex and drove to Gosier, east of the Marina Bas du Fort on the Grande Terre island of Guadeloupe. We got caught up in the rush hour traffic leaving Pointe-a-Pitre and were surprised at how long it took to crawl to Gosier. We checked out the town and the little harbor there and bought from fruit from a vendor, and then headed to the giant Cora supermarket just off the road on the way back to the boat. We had forgotten how large it is. It is like a Wal-Mart — selling clothing, electrical supplies, flat-screen TVs, liquor, and groceries. We filled up a large cart with mostly nonperishable items and then dragged it all onto the boat. Friday morning the repair work on Sabbatical III was finally done and we settled up with Chantiers Amel. The repair work did not take that many hours to perform, its just that they would appear at random times for 15 minutes to an hour and then disappear again. You never knew when they would return. Fred of Fred Marine, the local Yanmar diesel repair guy, was both timely and efficient in fixing our hydraulic shaft brake problem and is highly recommended. I did the customs check-out at the Captainerie, and then we headed out in the car along the southeast coast of Grande Terre towards St. Anne and St. Francois. We stopped for lunch in a little place in St. Francois where the fisherman were busy cleaning their catch. It was a great meal and the best deal we had encountered. The “menu” had accras (fried conch fritters), grilled fish with frites, and bananas flambe. As squalls drenched the fisherman cleaning their catch, we enjoyed our meal as it was served in slow motion. We continued out to Pointe des Chateaux, the eastern most point of the island. There we watched waves from the Atlantic crash on the huge rock formations. We stopped at the Cora superstore on the way back for perishable items, shlepped it all on the boat, and then got the car back just in time. We pulled away from the dock at Marina Bas du Fort at 8:30 this morning and had a great sail to Prince Rupert Bay in the island country of Dominica. We made between 7 and 8 knots the whole way with the wind on the beam, and are currently anchored in front of the small town of Portsmouth (15 degrees 35′ North, 61 degrees 28′ West). This is a place we really love – we were here twice in 2003/2004. The mountains are high and green. There are lots of waterfalls and giant hardwoods in the rainforest. The arrangement here is to use a “boat helper.” Boat helpers scan the horizon looking for arriving boats and then zoom out in their outboard powered wooden boats to get your business. In the past we have used Martin Carriere who goes by the name “Providence.” When we tell others that approach that we use Martin they all politely back off. Martin came out to greet us as soon as our anchor was down. He took me to customs to clear in and we made some tentative plans to talk about hikes and snorkeling. We will stay here until Tuesday or Wednesday. In between our waiting, I have been reading Steinbeck’s “East of Eden” – don’t know how I missed reading it when I was young. What a beautiful book. Mark is switching between reading “Marine Diesel Engines”, New Yorker magazines, and doing some important office work. I am getting lots of opportunity to practice my French – very fun for me. Amazing what you can do when you need to – there is really very little English spoken here. We have nice boat neighbors here too – all middle aged semi or fully retired people, just kind of hanging around enjoying life. We were invited to a small wine and cheese party last night with an interesting group of yachties- including an extremely British couple ( she was very much into royalty gossip – he, as the owner of a couple of radio stations in England was up on all the music fads), and another couple – one of whom was a teacher here . He was extremely smart and articulate and opinionated and talkative. It made for some interesting discussions – until the topic turned too much to religion and politics, and we decided it was time to go to sleep. Our blog posting of December 28 inexplicably did not post. I have reposted it below. This is what we have been up to since that blog entry was written. On the 29th we took a taxi up to Golden Rock Estate on the slope of Mt. Nevis. It is the site of an old sugar mill constructed of blocks of volcanic rock. It is now a small hotel and restaurant. It has beautifully landscaped grounds and good, but not great, views of the sea. After a quick walk around the grounds, we ate a nice lunch on the terrace. The rum drinks we ordered quickly reduced our hiking ambitions for the rest of the afternoon. Walking on narrow paths did not seem the prudent thing to do until the effects of the single drink we each consumed wore off. In the end, we did not lose any hiking time since it rained hard for the next hour. We sat in a large stone hall (circa 1815) and listened to music as the rain fell outside. The “nature walk” we started on was well marked to start but all directional indicators disappeared after 30 minutes. Laura has a great sense of spatial orientation in these circumstances and we were able to walk in a big loop back to the estate. Towards the end of the walk the monkeys came out of the rainforest in small groups– walking on the path, sitting on roofs, and nonchalantly grooming each other. The monkeys are very cute but apparently they are the reason that little fruit is available in the market — the monkeys eat it all. The hotel called a different taxi driver for our return to the dock at Charlestown. We asked him if we could stop somewhere to buy some papaya and bananas, neither of which we could find in the open air market at the port. He suggested that we stop at his home and pick some papaya off of his trees, and so we did. His house was just 100 yards off of the road. Using a long stick, he coaxed six papaya in different stages of ripeness off of two different trees. We then stopped at the Ram supermarket for bananas and we had the fruit that we craved. We went to town on the morning of the 30th, a Saturday, to perform the formal check-out of the boat and us, as required by the Nevis authorities, as we planned to leave the next day and it was not clear that Customs would be open on Sunday. The check-out procedure was positively streamlined compared to the check-in procedure requiring only a visit to one office as compared to three for check-in. We both noticed the calendar hanging on the wall in Customs that advertised a Chinese restaurant on “Jews Street.” After a quick visit to the internet cafe, we went looking for Jews Street. Street signs are not abundant in Charlestown but after we found an old Jewish cemetary and the Chinese restaurant we knew we must have found it. The grave stones were in both Hebrew and Spanish and dated from about 1640 to 1740. A small plaque noted that Jews once made up one-quarter of Charlestown’s 300 inhabitants by the year 1700. They were of Spanish origin and there had been a small synagogue adjacent to the cemetary but there was no evidence of the latter (although I suspected it might have been on the space now occupied by the Gold Coast Chinese Restaurant.) We had a quick lunch in the restaurant and returned to the boat. In the wind acceleration zone south of Nevis we did over 8 knots in reasonably light seas, and as night fell and we moved away from the island, we did a solid 7.5 knots. After a light supper, Laura went off to bed while I did the first watch. It was glorious. The almost full moon provided great visibility, and I gave my new IPod Nano its first work out listening to Rachmaninoff 3rd piano concerto and Lucia de Lammermoor. I was in no rush to have Laura take over. As we approached Montserrat, I could see an enormous dust plume blotting out the sky some miles ahead, so I decided to divert further west in order to keep our closest point of approach at 6 nm, triple the 2 nm exclusion zone. But soon ash and cinder started to fall on the boat, leaving a layer of grit on everything. The wind also dropped dramatically and boat speed dropped to 5 knots. Laura woke herself up and came to relieve me just as we passed Montserrat’s wind shadow and the wind picked up. As I lay in my bunk I heard a unusual noise from the engine room, something that is particularly odd when the engine is not running. I opened up the cockpit floor and climbed down with my trusty Petzl headlamp strapped to my head and found the hydraulic shaft brake had become disengaged from the flywheel, which was spinning free. This is a bad thing as this makes the transmission turn without having oil pumped to the bearings, leading to complete failure of the transmission. Bob Fritz experienced this problem on the delivery of Sabbatical III from Rhode Island to St. Maarten. He emailed me about it while at sea, I emailed Amel in France, and then forwarded their reply to Bob. It is a fairly simple adjustment. I had checked on the shaft brake during our first two sails after leaving St. Maarten, and it was nicely engaged so I thought the problem had been fixed. Coincidently, the last book I bought before leaving for our trip was Nigel Calder’s new edition of “Marine Diesel Engines”. One evening in St.Maarten, I read the section on hydraulic shaft brakes. That knowledge came in handy now. I located the right set of wrenches, loosened the set screw, and tightened the jack bolt which increased the clamping pressure of the brake shoes on the flywheel. The flywheel stopped its spin. I had Laura start the engine and put it into gear to make sure that I did not overtighten so that the hydraulic release would not free the transmission. It worked fine. I climbed up but before I could get back and into my bunk the weather changed. A series of squalls blew through so I stayed up with Laura until they passed. I went back to bed but before I could sleep, Laura called me to tell me that the shaft brake had disengaged again. This time the engine room was hot as we had run it. With the engine going and in gear, I could see how far the brake shoes were from the flywheel and adjusted the jack bolt so that the shoes were just off the flywheel. When Laura stopped the engine, the brake clamped solidly on the flywheel. I came up from the engine room dirty and drenched in sweat. I cleaned up and went back to my bunk. But then the wind died and the boat rolled badly in a sloppy sea. I could not sleep in an hour of trying with the boat rolling and the engine on, so I returned to relieve Laura. When the wind picked up again and the boat was going 8+ knots, the brake disengaged once again. The engine room was now hot like a sauna and, try as I might, I could not move the jack bolt in any further. I then saw what the problem really was — the whole hydraulic brake assembly had come loose from the engine frame. The whole things just moved aft under the pressure of the brake shoes on the flywheel which itself was being turned by the force of water against the propellor while we were under sail. I tried strapping the thing into place with some cinch straps, but there was no way I could get the brake to hold when the boat was moving quickly through the water while under sail. So we reduced sail dramatically. With the boat slowed to 5 knots, the flywheel did not turn and the transmission would not burn out. As it was I got only one hour of sleep the whole night as my ear was constantly listening out for the turning of the flywheel. We motored the last six or seven hours of the trip in very rolly seas with Laura on watch, and even though the shaft brake is not an issue while under power, the roll was too severe to let me sleep. We came into Pointe-a-Pitre at about 2:30 pm, 4 hours later than we expected, both of us tired and hot. The Marina Bas du Fort in Pointe-a-Pitre is not the prettiest place, but it sure is restful. One minute after backing the boat to a stern-to dock, we had the shore power connected and the AC running full blast. The 95 degree interior cooled down quickly, and we napped deeply for three hours after taking showers. At 7 pm, Bob and Lorelai Diamond of the boat next door knocked on the hull and asked us to join them at a restaurant for New Years Eve supper. We had a delightful evening with them but our fatigue could not quite get us up past midnight. Today (January 1), we checked in (by fax — takes two minutes), bought one of these great French Caribbean phone cards, and talked with the kids, my mother, and Laura’s mother. Tomorrow, I hope to get some repair people on the boat and get things back into proper shape. We are still in Nevis. Tomorrow we plan to go to Golden Rock Estate, which is up high on the slope of Mt. Nevis, for a hike in the rainforest. There are supposed to be great views and lots of monkeys in the trees. Winds in the anchorage have picked up considerably but luckily there is still only a light swell here on the leeward side of the island. We listened to Chris Parker of CaribWX give his 8:30 am forecast on the SSB radio (similar to ham radio). He broadcasts from the British Virgin Islands. Lots of sailors listen in to his broadcast, and then identify themselves and ask questions about forecast conditions for the route they have planned over the coming days. The winds and seas are forecast to abate on Sunday and early Monday morning, and then pick up again, so we have planned to sail the 115 nm. to Pointe-a-Pitre, Guadeloupe in one go, leaving Sunday late afternoon and arriving Monday morning. The other possibilities did not seem attractive. 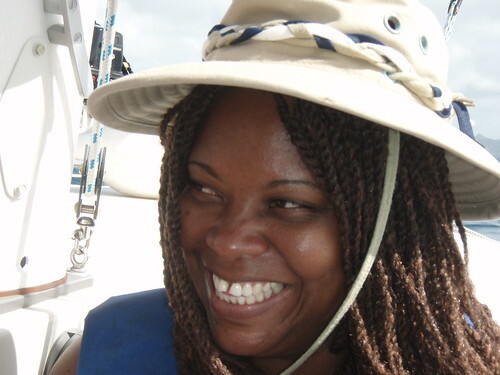 We could sail to Antigua and then on to Guadeloupe, but the sail to Antigua would be directly into the wind. We could sail to Montserrat, but it was pretty much destroyed by a volcano a few years ago, most of the population evacuated, and there has been an exclusion zone around much of the island due to falling ash and volcanic flows. As it is,our list of preparations for the sail to Guadeloupe include calling the Montserrat Volcano Observatory to make sure our course past Monserrat takes us far enoughaway to avoid the sticky ash that has been reported to fall downwind of the island. Please check our slide show. We have added photos from St. Maarten and St. Barts. You can get to the slideshows from the home page, click on slide shows, and then the Caribbean Dec. 2006 link. The resolution looked poor from the internet cafe here in Nevis, but that could have just been the computer that I wsas using. I think that I may have fixed the problem with the formatting of the blog but I am not certain. If it looks funky, please let me know.